The AFC Championship game on January 6, 1980 featured a rematch of the previous year’s participants, the Pittsburgh Steelers and Houston Oilers. The clubs were rivals in the AFC Central, where the Steelers had finished first with a 12-4 record and then thrashed the Dolphins in a Divisional playoff game and Houston came in second at 11-5 to qualify for the postseason as a Wild Card, defeating Denver in the first round and then upsetting the Chargers in their Divisional game. The teams had split their games during the regular season, each winning at home. Under Head Coach Chuck Noll, the Steelers had won the Super Bowl the previous season and three in five years. 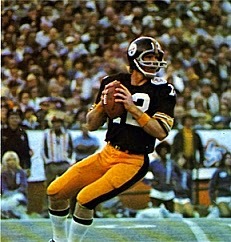 At 31, QB Terry Bradshaw (pictured above) was at the height of his abilities and directed the NFL’s highest-scoring offense that included wide receivers Lynn Swann and John Stallworth plus the running of FB Franco Harris, who crossed the thousand-yard rushing threshold for the seventh time in eight years. HB Rocky Bleier was splitting time with Sidney Thornton, but remained a capable performer. The top-rated defense was still anchored by DT Joe Greene and contained such stalwarts as DE L.C. Greenwood, OLB Jack Ham, MLB Jack Lambert, CB Mel Blount, and SS Donnie Shell. Houston was coached by O.A. “Bum” Phillips and featured an offense centered around second-year RB Earl Campbell, who rushed for 1697 yards and 19 TDs. QB Dan Pastorini had an outstanding deep threat in WR Ken Burrough (40 catches, 752 yards, 18.8 avg.). However, Campbell was playing hurt and had missed the Divisional playoff game and Burrough was below par and ended up seeing little action against the Steelers. The heart of Houston’s 3-4 defense was NT Curley Culp and linebackers Robert Brazile and Gregg Bingham, and there were other notable performers in DE Elvin Bethea and FS Mike Reinfeldt, who led the NFL with 12 interceptions, plus SS Vernon Perry, who intercepted four passes in the previous week’s game. There were 50,475 fans in attendance at Three Rivers Stadium on a bitterly cold day. 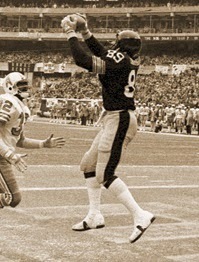 The Steelers had the first possession and advanced into Houston territory thanks to a pass from Terry Bradshaw to John Stallworth for 17 yards, but after reaching the 35, a throw intended for TE Bennie Cunningham was intercepted by Vernon Perry, who returned it 75 yards for a touchdown. Toni Fritsch added the extra point. The teams exchanged punts, but the Oilers started off at their 17 and lost yards when Dan Pastorini was sacked on third down back to his 10 by L.C. Greenwood. Cliff Parsley’s 31-yard punt gave Pittsburgh the ball at the Houston 40 and Bradshaw immediately threw to Lynn Swann for 15 yards. A penalty moved the Steelers back and they were facing a third-and-14 situation when Bradshaw, unable to find an open receiver, scrambled for 25 yards to the four yard line. They couldn’t penetrate the end zone from there, but Matt Bahr kicked a 21-yard field goal to narrow Houston’s margin to 7-3. The Oilers made a big play on their next series when Pastorini completed a screen pass to FB Tim Wilson that gained 41 yards to the Pittsburgh 44. Two plays netted a loss of a yard, but on third-and-14 Pastorini threw to HB Ronnie Coleman for 32 yards. Two plays into the second quarter, Fritsch kicked a 27-yard field goal to put the Oilers up by 10-3. The Steelers responded with a 67-yard drive in 10 plays. Bradshaw completed five passes, starting the series with a 17-yard completion to Swann, keeping it going with third down throws to Rocky Bleier for eight yards and Swann for 11, and finishing it off with a seven-yard pass to Cunningham for a touchdown (pictured at left). Bahr kicked the point after to tie the score at 10-10. Houston’s next series ended with a third-and-19 pass from Pastorini to WR Mike Renfro that was complete, but the receiver fumbled and Mel Blount recovered for the Steelers. Pittsburgh advanced 49 yards in six plays as Harris and Bleier ran effectively and Harris also gained 15 yards on a swing pass. Bradshaw threw to Stallworth for a 20-yard TD, Bahr converted, and Pittsburgh was in front by 17-10. The Oilers regained possession with 2:25 to go in the first half, and on the third play CB Dwayne Woodruff intercepted a Pastorini pass to give the Steelers the ball at their 45. However, after reaching the Houston 23 with seven seconds to go, Bahr’s 40-yard field goal attempt was wide and the score remained unchanged at halftime. The teams traded punts throughout the third quarter, with neither able to mount a drive until the Oilers, starting from their own 14 with 6:39 remaining in the period, advanced methodically down the field. 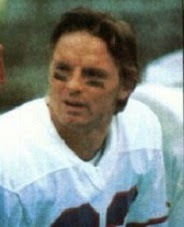 Pastorini completed three passes, with one to Renfro (pictured below) for a 21-yard gain to the Pittsburgh 23 and a third-and-seven throw to Coleman for 14 yards to the six. The visitors could get no farther, with a pass to Renfro in the corner of the end zone ruled incomplete because the receiver failed to maintain possession before going out of bounds (a call that was vigorously disputed), and on the first play of the fourth quarter, Fritsch kicked a 23-yard field goal to narrow Pittsburgh’s lead to 17-13. The Steelers came back with an 11-play, 55-yard possession. Franco Harris ran for 13 yards on first down and Bradshaw completed a pass to Swann for 21 yards on a third-and-21 play. The series finally stalled at the Houston 22 and Bahr was successful on a 39-yard field goal attempt, once more putting the defending champs ahead by seven points. A penalty on the ensuing kickoff had the Oilers starting from their 11 and, while Pastorini completed five passes, the last one to WR Guido Merkens resulted in a fumble that Donnie Shell recovered for the Steelers at the Houston 45. Harris ran twice for eight yards and, on third-and-two, Bradshaw threw to Bleier for a 20-yard gain. With Harris and Bleier picking away, Pittsburgh reached the four, and from there it was Bleier running for a touchdown. Bahr added the extra point, but with less than a minute remaining on the clock, the result was not in doubt. The Steelers won by a final score of 27-13. Pittsburgh led in total yards (358 to 227) and first downs (22 to 11), grinding out 161 yards on the ground and holding the Oilers to 24 rushing yards. Houston turned the ball over three times, to two suffered by the Steelers, although the Oilers had a three to one edge in sacks. Terry Bradshaw completed 18 of 30 passes for 219 yards and two touchdowns while giving up one interception. 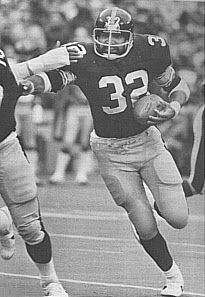 Franco Harris (pictured at left) rushed for 85 yards on 21 carries and also caught six passes for 50 yards. Lynn Swann gained 64 yards on four pass receptions and John Stallworth added three catches for 52 yards that included a TD. Rocky Bleier contributed 52 yards on 13 rushing attempts and caught three passes for 39 yards. For the Oilers, Dan Pastorini was successful on 19 of 28 throws for 203 yards and no TDs while being picked off once. Earl Campbell was well defensed by the Steelers, who did an excellent job of closing off his running lanes, and he was held to just 15 yards on 17 carries. Tim Wilson, who gained nine yards on four rushing attempts, led the team with 7 catches for 60 yards. Mike Renfro had three receptions for 52 yards, but it was the one that was ruled incomplete in the end zone late in the third quarter that drew the most comments afterward. The Steelers went on to defeat the Rams in the Super Bowl, giving them back-to-back titles and a total of four in six years. Houston again went 11-5 in 1980, finishing second to the Browns this time (Pittsburgh fell to third place at 9-7). The Oilers didn’t make it to the conference title game, as they were routed by Oakland in the Wild Card playoff round (a defeat that cost Coach Phillips his job).